If teachers are afraid, try to identify what is causing the distress. Is it a fear of failure? ... a fear of what others will think? ... a fear of the unknown? Help them work through whatever is specifically bothering them so they don't panic and run. Also, remind them of God's presence and power to help them in time of need. Bible teachers can learn much from the fears Moses expressed at the burning bush. 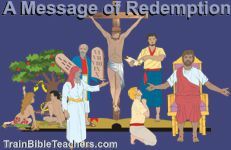 This 13 page teacher training devotional provides reminders of promises in God's Word we can hold on to today, assuring us of who He is and what He can do through us. We might never have a burning bush experience, but we do have the same God who is just as faithful and powerful today as He was back then.